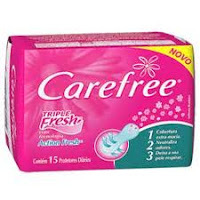 FREE Carefree Liners after Coupon! If you got the Target insert in today's paper, you can use one of those coupons to score FREE CareFree Pantiliners! NOTE: In case your store's prices are a little higher, you can print a $0.50/1 any Carefree coupon here that you can stack with the Target coupon, making it free as well!